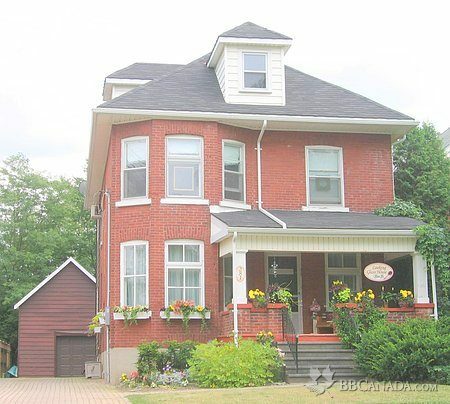 1913 Century Home reflects the charming character of Stratford. Three beautiful suites with hardwood floors and air conditioning are ideally suited for festival visitors. Groups welcome! Two rooms fitted with queen size beds; One room fitted with a king sized bed, or two twin beds perfect for friends. Each room has a full ensuite bathroom. Full breakfast buffet features freshly baked goods, fresh fruits, and a hot entrée. Common lounge is provided with satelite t.v., wireless inernet. Kitchen area provides access to a fridge, microwave, coffee maker, & kettle. Two minute walk to the river; Walking distance to festival theatres and downtown boutiques. Nearby parks are excellent for picnics and strolls through Art in the Park. Location is also great for hiking, golfing, and shopping around Stratford.